Description: Ender’s World conscripts almost two dozen writers of science fiction, fantasy, and young adult books to offer new perspectives on the 1985 novel, along with insights gleaned from other Ender stories that fit within the Ender’s Game chronology, including Ender in Exile and Ender’s Shadow. In addition, military strategists Colonel Tom Ruby and Captain John Schmitt offer insight into the human-Formic war. A contribution from Aaron Johnson, the coauthor of the Formic Wars prequel novels, is also included. 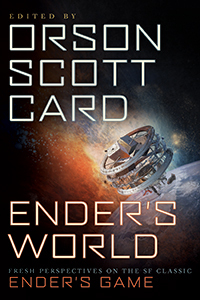 Certain questions asked on Smart Pop Books’ Tumblr by July 1, 2012 at midnight Eastern time will be answered by Orson Scott Card and included in Ender’s World.